Abandoning the town has no extra messages. Lame. Sharing gets us a whopping 20 goods. Yes, the kings are apparently squabbling over 60 goods total. These two get us some nice flavor text, at least. 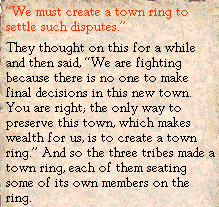 But the proper answer is making a ring, because how else is a town supposed to be governed? 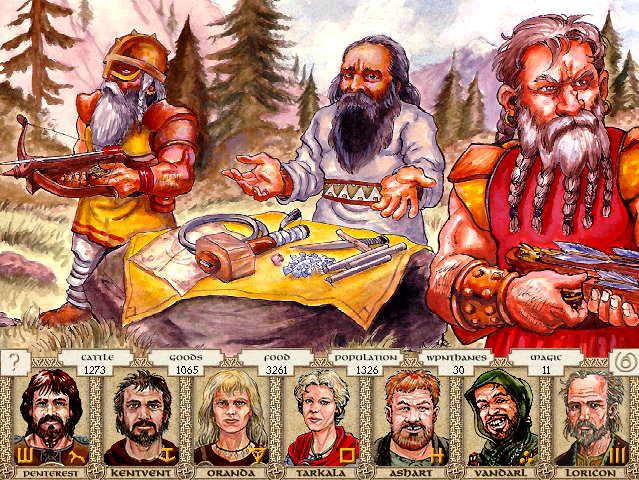 While on an exploration and trade mission north of our tula, your people are approached by a trio of dwarfs who wish to trade with Orlanthi clans. Referring to their leader, they say, "Isidilian say we not yet reached schedule point where unauthorized may trade with outsider humans. But we individuals with own souls, not just parts of machine. We wish prove such, and enter trade immediately." Your explorers come back to ask what to do. -Do not go back to meet them. -Report them to Isidilian's functionaries. -Suggest another clan they might trade with. -Trade normal goods with them. 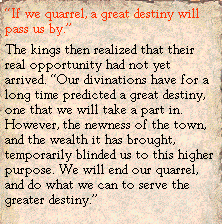 We could gain the favor of a powerful foreign king by reporting them to Isidilian. Or of another clan, by giving them an opportunity. 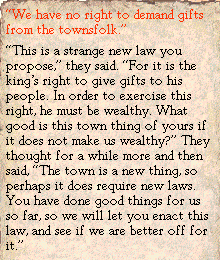 They are breaking the laws of their people, but their laws mean nothing to us. Who knows what wondrous goods these strange beings might have to offer? Better stick to trading treasures. Who knows what these strange beings consider valuable? There is no danger here. They want to be individuals, like us.